This continuing education course serves as a guide to determining muscular or fascial imbalance and whether that imbalance contributes to a patient’s or client’s pain or dysfunction. 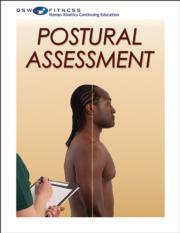 Define the term posture and provide examples of factors that affect posture. Give two reasons for carrying out a postural assessment and provide examples of the kinds of clients for whom postural assessment is not appropriate. List some of the equipment that may be helpful to have when carrying out a postural assessment and describe how a plumb line is used. Give examples of what to look for when assessing a client from standing posterior, lateral, and anterior views as well as for a client in a seated position. State the possible consequences of your observations with respect to muscles and joints.